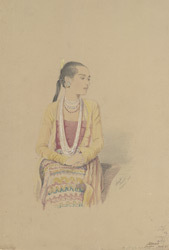 Watercolour with pen and ink of a portrait of Mameet from 'A Series of Views in Burmah taken during Major Phayre’s Mission to the Court of Ava in 1855' by Colesworthy Grant and dated 7 August 1855. This album consists of 106 landscapes and portraits documenting the British embassy to the Burmese King, Mindon Min (r.1853-1878). The mission started from Rangoon (Yangon) and travelled up the Irrawaddy (Ayeyarwady) River to the royal capital of Amarapura, founded in 1782. Grant (1813-1880) was sent as official artist of the mission.